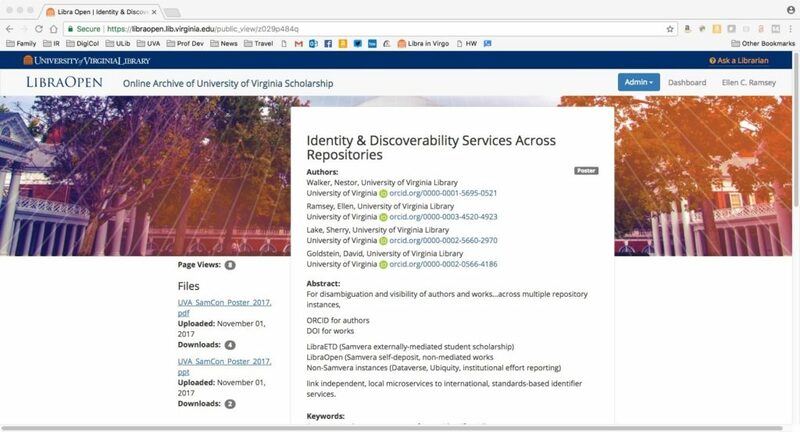 The University of Virginia Library has integrated ORCID with two of their institutional repositories: an Electronic Theses & Dissertations (ETD) repository and an open repository, both running on Samvera. 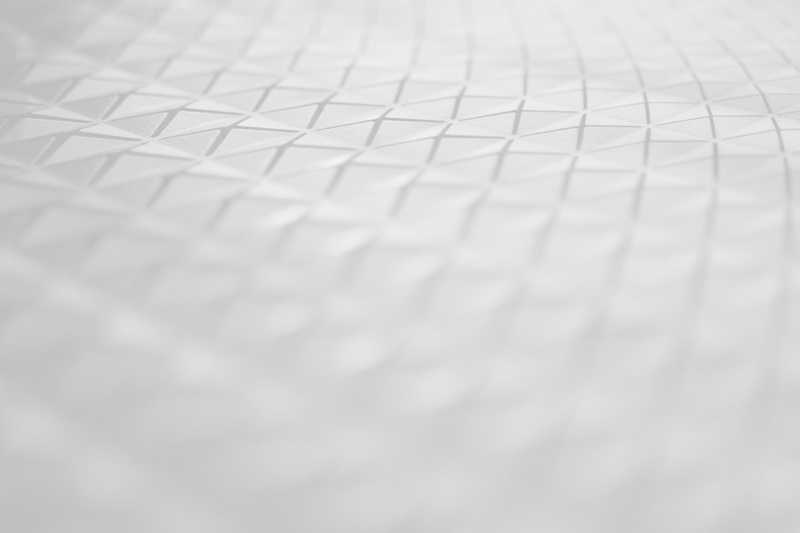 The ORCID configuration is set up as a microservice rather than built in to the software. 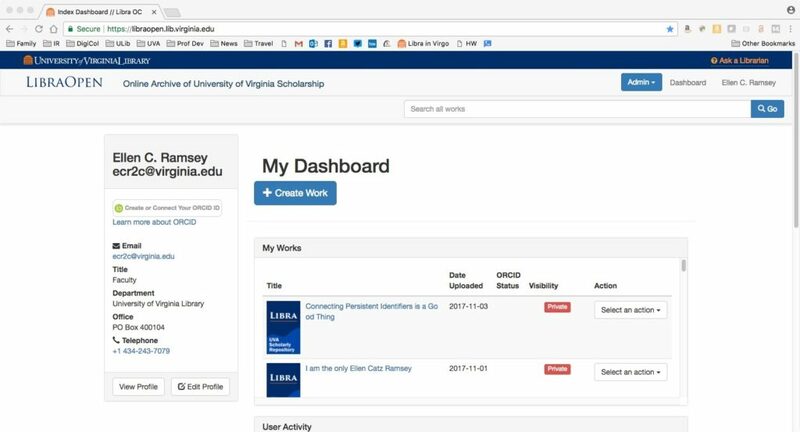 ORCID functionality is available to the user when logged in to their dashboard, allowing an authenticated connection between the user’s ORCID iD and their works in the IR. Authenticated ORCID iDs are displayed next to authors’ names on their works pages, and the system writes/asserts works information on to the researcher’s ORCID record on their behalf. See a demo recording of how this works. A user logs in to their account within the IR. On the “My Dashboard” page, there is a “Create or Connect Your ORCID iD” button prompting the user to connect their ORCID iD with their account in the IR. 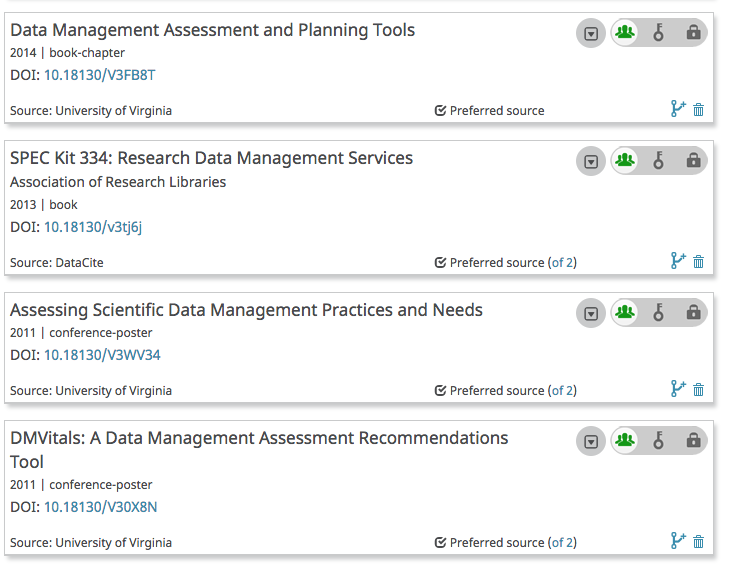 Once they register or log in to ORCID, the user is then presented with an authorization screen asking them to authorize permission for the University of Virginia to read limited-access information on their ORCID record (users can set their ORCID data to public, private, or “trusted parties”/limited access), and to add or update their research activities, such as works. Once the user authorizes this permission, they receive a message on their IR user dashboard confirming that their ORCID iD is successfully connected. Their authenticated ORCID iD and additional information like an access token is collected and connected to the IR system, and their ORCID iD is displayed next to their name in their dashboard and on any of their works pages. 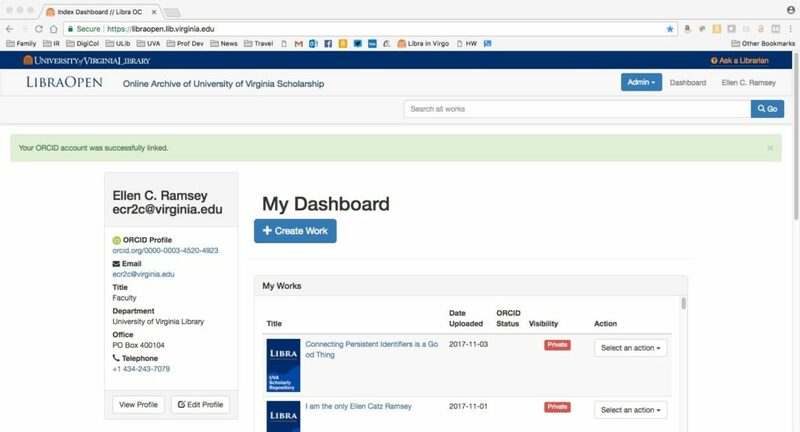 In the IR user dashboard, users can see a list of works they have in the repository, the visibility settings for each work, and whether or not the work is appearing in their ORCID record. 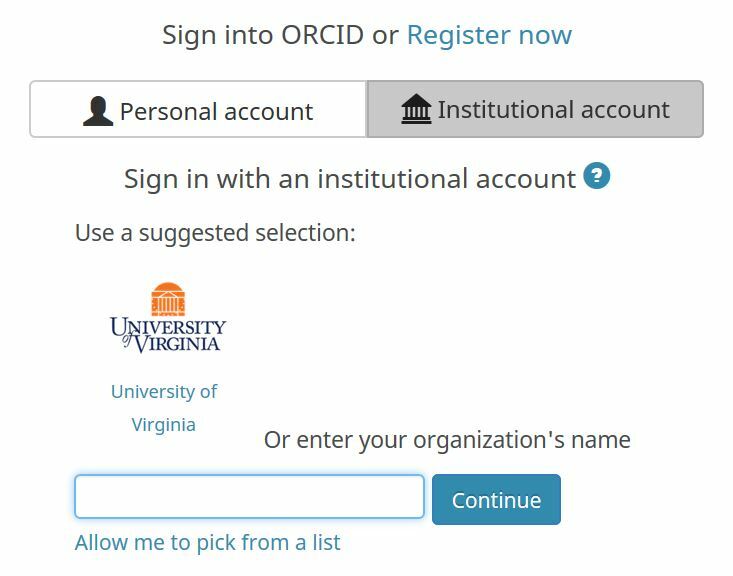 Once a user connects their ORCID iD, the UVA system is set up to automatically write public works data to the user’s ORCID record when new items are deposited. If a user already has items in the repository before their ORCID iD is connected, once they connect, any public works in the IR will be automatically written to their ORCID record. 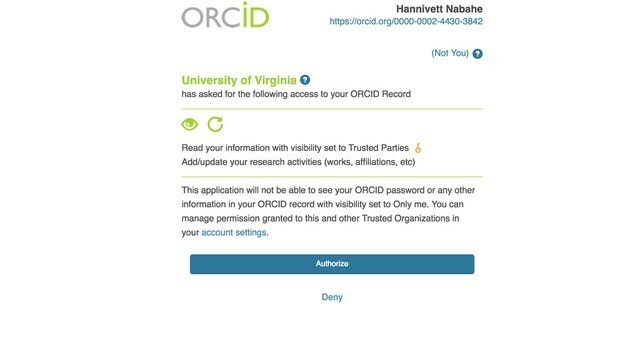 Authors can revoke the permission they have granted UVA to post to their ORCID profiles at any time by logging in to their ORCID record directly and removing UVA as a trusted party in the “Account Settings” section of their ORCID record. UVA maintains the display of ORCID iD on works pages in that case, but no longer writes public works to ORCID if the author revokes the permission. 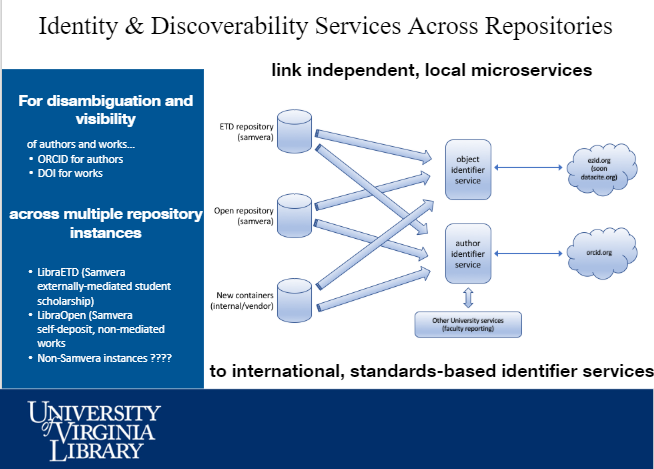 Many thanks to Sherry Lake and Ellen Ramsey at UVA for sharing these slides and presenting on this integration at the Sept. 2018 ORCID US Community Showcase webinar. For questions, please contact orcidus@lyrasis.org.